Organized by BAY AREA SRI LANKAN YOUTH from MILPITAS, BERKELEY, SACRAMENTO and SANTA CLARA Temples !!! The Bay Area Sri Lankan Youth would like to thank everyone for participating in the 2018 Backpack Drive. We were able to donate 150 backpacks with school supplies to four disadvantaged schools in Salinas County. We are appreciative for the kind and generous support from all the donors across the four temples: Dharmapala Institute- Milpitas, Berkeley Buddhist Vihara-Richmond, Buddhi Vihara – Santa Clara, and American Buddhist Seminary- Sacramento. This drive would not have been possible without you. We would especially like to thank all the children who helped to make this drive a success. Looking forward to great accomplishments next year as well! Each backpack with supplies costs about $30. Any supplies donated would be greatly appreciated. We also accept monetary donations via cash or checks. Please make any checks payable to Dharmapala Institute, and write 2018 Backpack Drive in the Memo. Thank you! Hello! 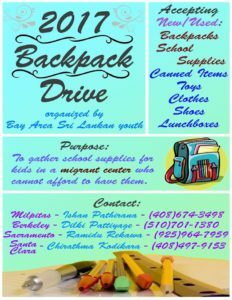 This year the Bay Area Sri Lankan Youth are again working on a project to donate school supplies and backpacks to a disadvantaged elementary school in Salinas, California. WHAT TO DONATE: Any backpacks and school supplies would be great! Supplies include: Pencils, Pens (Black, Blue, Red), Pencil Boxes, Pencil Sharpeners, Erasers, Folders, Binders, Binder Paper, Scissors, Glue Sticks, etc. 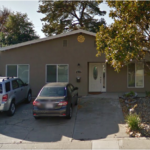 WHERE: Buddhi Vihara- Santa Clara, Dharmapala Institute- Milpitas, Berkeley Buddhist Vihara- Richmond, and American Buddhist Seminary- Sacramento. All 4 of these temples will have a box where you can drop off any backpacks or school supplies. MONETARY DONATIONS: Accepting cash or checks. Please make any checks payable to a temple of your choice, and write 2018 Backpack Drive in the Memo. The Bay Area Sri Lankan Youth has been collecting supplies for our Backpack Drive for the last few months. However, our drive will be ending on July 31st. We will be delivering the backpacks and supplies to the migrant encampment in Hollister during the first week of August. As back to school season is already here, we would like to encourage families to donate any backpacks or supplies to one of the four temples. We are currently below our goal of 100 backpacks, and would be very appreciative of any material or monetary donations. Please make any checks payable to a temple of your choice, and write 2017 Backpack Drive in the Memo. Thank you to those who have already spent time and money for such an important cause! All the Backpacks have been sorted. Thank you to everyone who donated and helped us to make a difference! Although what we have done was small compared to the rest of the world, it was the result of a rippling effect started by others across the ocean and even people here who strive for change. Distribution: We managed to donate 110 backpacks and 3 boxes of school supplies to Sherwood Elementary School kids in Salinas. Thank you to everyone who donated and helped us to make a difference in the lives of these elementary schoolers. 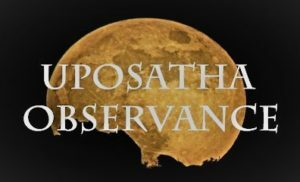 Area coordinators Ishan Pathirana, Ramidu Rekawa, and Chirathma Kodikara as well as organizers Dunilka Ratnayaka and Udara Kodikara could not attend but managed to send a message of love and hope to the children just like everyone else. School district Board recognition: Ishan Pathirana went to accept a certificate of appreciation from Salinas City Elementary School District on behalf of the Bay Area Sri Lankan community. Thanks again to everyone who contributed to this project. Let’s keep making a difference in the lives of others.